The Handball Family around the world mourns the passing of David Chapman. Chapman, 42, passed away suddenly in his home, Tuesday, October 10. David Chapman was the youngest player to win a USHA National Four-Wall Open Singles Title at the age of 17 in 1993 when he defeated Randy Morones in the final. He also won the doubles that year. Chapman was a nine-time USHA Four-wall National Singles Champion, won two World Singles titles, held multiple doubles titles and was the No. 1 ranked pro handball player for nearly 10 years. Whenever there’s discussion on who was the best four-wall handball player ever, Chapman’s name is at or near the top of the list. In September, Chapman reached the final of the one-wall small ball final at the 3WALLBALL Outdoor Championships in Las Vegas. Chapman’s death is a shock to all and our deepest sympathy goes to his family. Read David Fink's touching tribute to David Chapman [HERE]. TEMPE, Ariz. -- The USHA, through the FIRST ACE Development Program, aspires to train new handball instructors to teach the game in schools, rec centers and clubs across the nation. Through the efforts of Arizona State University Handball Coach Dan Willeford, a Handball: Teach the Teacher Clinic was held at the ASU Rec Center on Saturday, October 7. Coach Willeford organized and conducted the clinic which certified eight new instructors, five of whom are on the ASU Handball Team and working to be part of the Mardak Endowment Program. The teaching clinic began with a "Handball Jeopardy" Q&A session in the classroom, reviewed lesson plans by LeaAnn Martin and Pete Tyson, discussed teaching strategies, and provided demonstrative drills on the court. The goal is to have the certified instructors venture to Metro Phoenix high schools to promote handball and teach the game to new players. Many of the instructors are alumni at the schools, and as members of the college handball team at ASU, they're testimony that students can play the game and compete at the collegiate level after high school. The FIRST ACE Development Program will provide handball equipment for all the new instructors who will teach at their respective schools. This effort at Arizona State (and at other universities around the country), is part of the Mardak Community Challenge, where communities awarded funding will be tasked to find local funding to match the Mardak awards. The Mardak funds will pay college students to teach handball and mentor younger students. Thank you to Coach Willeford, Sun Devil Handball and the new instructors for their efforts to Grow the Perfect Game! The following feature appears in the August 2017 Handball Magazine. USHA Members can access the full e-Magazine issue by logging on and visiting the "Member Section." Not a USHA Member? JOIN HERE. Sala concentrates in his 2008 USHA 0ne-wall Singles final victory against Satish Jagnandan. New York handball players need no introduction to Cesar Sala. He has made his name for many years as a one-wall champion, with titles in big-ball and small-ball singles and doubles. Sala has a talent for all forms of handball, three- and four-wall included. One-wall, however, is the handball culture in New York, and Sala shares his story of developing his game in the parks and streets of NYC. Sala’s parents, Cesar and Ana, were born and raised in Puerto Rico. After Cesar Sr. left Puerto Rico for New York, he and Ana wrote letters back and forth, and he eventually proposed through a letter. Ana packed her things and ventured to New York to marry him. They were blessed with three daughters and a son, Cesar, the youngest in the family. Today Sala is 39, and he and his wife, Kathy, are raising daughters Kaycee, 10, and Emma, 7. They live in the Bronx, where Sala is a New York City police officer. Sala, daughters Emma and Kaycee and wife Kathy. We met at a lounge called Redemption, and it was magic from the first moment I saw her. She drew me in with her beauty and enchanted me with her demeanor. Three years later we were married. Our beautiful girls are both passionate about dancing, makeup and fashion, like their mother. How and where did you start playing? I’m originally from Brooklyn, where I went to Lincoln High School and Kings-borough Community College. I started playing in the early 1990s. My home courts were at Coney Island. The same courts where the pros play that we read about in the magazine? Yes. I have watched some of the one-wall greats, such as Albert Apuzzi, Al Torres and the infamous Joe Durso. Coney Island was filled with great players. I was drawn to the game as a teenager. The atmosphere of being by the beach and playing in the sun was great. The game is also cheap to play, but the best part is that anyone could just show up and call next to get a game. Tell us a little about the New York handball environment. Most places around the country, people would have to call each other to organize games. At Coney Island and most NYC courts, people just show up and find games anywhere! There are thousands of one-wall courts all over the city with people playing. Coney Island and West 4th Street were where a lot of the heavy hitters played. Which ball is preferred today at Coney Island? Coney Island players compete in big ball, currently the dominant one-wall game, and small ball, the more traditional form. I gravitated toward the small ball because I enjoyed that world and got involved in three- and four-wall. I remember seeing this big powerhouse lefty four-wall player with a big loopy swing come in and shock the one-wall world by making it to the national final! Little did I know he was trying to be the first in a very long time to win all three nationals in the same year. As far as I know, John Bike is the last man to be in all three finals in the same year. He made a big impression on New York handball at that time. You’re a one-waller. Describe the difference between playing one-wall vs. three- and four-wall at the open level. As crossover play binds the handball world, this sport will continue to climb into the realm of being a mainstream sport. Pro players from each version of our game are creating a larger spectrum of community by exchanging ideas, experiences and skill sets that pertain to their version of the sport. For me, four-wall has been the most mentally challenging with all the extra angles and options. I love playing four-wall, but it can be a bit frustrating. My limited back wall, combined with aggressiveness I learned from one-wall, have led to some frustrating moments against the top four-wall players. In 2008 Danny Bell and I played David Chapman and Emmett Peixoto in the final of the Long Island Open four-wall event. David and Emmett were able to expose my weaknesses and beat us handily. Yes, I guess they probably have. They are great players. I remember playing Vince Munoz, who was the three-wall champ at the time, when he graced the courts of Coney Island at the one-wall nationals. I was an established one-wall pro who had won a few events. I went into the game with a chip on my shoulder and was able to beat him in the first game with ease. The second game was close, and Vince made some adjustments and edged me out by a point. The tiebreaker was exciting, and I was lucky to get the win against a legendary player. My first time playing three-wall, however, was an eye-opening experience. My first-round match was none other than Vince Munoz himself! Vince cleaned my clock as I scored a mere 3 and 6. I remember feeling like I was in every volley but I wasn’t scoring. To a one-wall player, the three-wall court is extremely long. Playing four-wall doesn’t entirely prepare you for the long side walls with no back wall. Where do you play nowadays? How often? I’ve had a shoulder injury, but I’ve tried to keep involved as much as I can by volunteering my time to the ICHA, which has dedicated 20-plus years to our inner- city youths by having travel teams and coordinating events for youth development in NYC. Working with the community is important to me as an NYC police officer. I’m looking forward to playing again and competing at the World Police and Fire games in August. Sala (left) with favorite partner Joe Kaplan. Name your favorite doubles partners. My favorite partner without question would have to be Joe Kaplan. Joe embodies everything I strive to be as a handball player and as a person. Joe and I have played together for almost 20 years and have won our share of tournaments. His consistency combined with my knack for being unpredictable have earned us some nice success. Heart, loyalty and commitment are qualities to be admired, and Joe embodies precisely that. The first national doubles event Joe and I won was an amazing experience. We faced a familiar team of Kendell Lewis and Robert Sostre. They beat us in the final of another event earlier that year. Kendell and Joe were former partners, so there was always an extra intensity whenever we’d play him. Kendell was not only a talented handball player but also an exceptional athlete. Robert was the dominant figure in paddleball as well as a multinational handball champion. We defeated them in a hard-fought tiebreaker for the first of our four national doubles titles. How does your family view the sport with all your accomplishments? My three ladies have shown their support both at home and at events whenever possible. My daughters will play ball at some point, and I’d like to see them play as a doubles team. I think their personalities along with their physical attributes will make for a strong team. Kaycee is lefty, tall and slender, while Emma is shorter and a right-hander. They are both very competitive and have interest in the game. It would be nice to see them play. How is the USHA doing, in your view? The USHA, ICHA and SAHA have meant so much to NYC handball for decades now, and I am forever grateful for the hard work they’ve put into this great game. They’ve paved the way for current organizers and associations such as wallball and the WPH. What do you think of the WPH? The WPH and wallball are really taking handball to the next level in helping this great community grow. Wallball founder Jasmine Rey is seemingly everywhere shaking hands all over the world spreading the game of handball. Dave Vincent and David Fink are doing a great job with the broadcasting and handling of pro play. What do you see as the most important thing for continuing one-wall handball? What about three- and four-wall? In my opinion, the ball is a key to pushing the game to another level. We need a ball that’s somewhere between a small ball and a big ball that could work for all versions of the game. Perhaps a ball that has the speed and weight of a small ball along with the feel of a big ball. The big ball is too slow for the larger three- and four-wall courts. The current small ball is too fast for the smaller one-wall court. I agree the games are great as they are now, but I believe changing the ball might help the game improve as a spectator sport. In New York people are playing, hearing about and seeing more handball every day. It is only a matter of time before we reach the biggest stage, and I’m looking forward to being part of that. Chatten Hayes, 2012 Carl Porter Award recipient and Über-Volunteer hostess is rocking a new look this week. And David loves it (and her)! She had major surgery in early September, and doctors found ovarian cancer. She began chemo earlier this week. The surgeon expresses the discovery like this: “We threw a brick through a plate-glass window and got all the big pieces swept up, and now we are doing some “mop-up” chemo to take care of any remaining cells.” Her cancer is the type most responsive to treatment and it didn’t spread beyond her abdomen. Chatten wants her handball family to know she feels wonderful about “Doc G’s” sense of humor and skill and the care she’s received. She and David are so grateful for the enormous support shown by friends, family, neighbors, players, colleagues and even the mailman and regulars at the coffee bar. “I am grateful for my lifetime of excellent health. This was my first time in a hospital, let alone having any surgery. We joke a lot over here, go big or go home! Chatten Hayes with hairstylist Eian and husband David Steinberg. As for my hair, well, I think we all know how I feel about my HAIR. It’s basically the only vanity I indulge in – I will never be on the best dressed list or drive a hot car. But … my hair. When I was told I’d lose it, I decided immediately to shave my head. And we made a party out of it. My friend Eian Petry has been keeping my locks gorgeous for more than 22 years. He opened his salon last Monday (which was also his 60th birthday) to do it. We laughed so hard my hair flew off!!! I will continue to sport this look (while spending next to nothing for hair care – sorry, Eian) for a few months, and don’t be surprised if the Pacific Boxer team shows up in Springfield next February with a few baldies! It was discussed at a team meeting a couple of weeks ago. Solidarity, baby! And the First Donor is: Sean Lenning – I’m a fan of you and your hairline! You are going to have a great WPH R48Pro season! So I count $50 in the kitty already. Oh, and maybe I should include David? Ok, $100. I need to add that we are being very selective about where our information is coming from. David and I are limiting ourselves to information and anecdotes provided to us specifically about MY cancer from MY team. It’s enough to take in what’s right in front of us. We are asking everyone to curb kindly impulses to provide more for us to digest. We appreciate your understanding. BROOKLYN, N.Y. -- Timbo Gonzalez is Mr. One-Wall, 2017. The athletic national Wallball champ added another slam, beating Billy O'Donnell in the singles and teaming with Jurell Bastidas to top Michael Schneider and William Polanco. Andy Rousseau slammed in the masters, taking the top prize over Robert Sostre in singles and teaming with Jared Vale to beat Sostre and Pete Pellegrini in the doubles. Final results for the 57th USHA National One-Wall Championships HERE. The summer of 2017 will be remembered as the “Year of One-Wall.” Our first National Championship of the season was the Small Ball Junior Nationals, the second year in-a-row we joined forces with the Inner City Handball Association. This year’s event featured players from out of the New York Metro area and drew a total 102 contestants. This was all made possible by the collaborative effort of USHA, ICHA and WPH. Next, the Wallball Nationals offered the richest prize money list ever and also drew over 100 contestants. There were upsets and new stars in the women’s doubles while Timothy Gonzalez reclaimed the top spots in the men’s events. Our Small Ball Nationals, held August 3-6 are a day shorter than usual and are next on the agenda. The prize money purse will top $10,000, and the USHA Board will be in town, holding their first summer board meeting in the Big Apple. That they join us at the one-wall is historic but of even greater importance is that the Borough of Brooklyn has declared Saturday August 5th “Handball Day” and the Brooklyn President is presenting the Citation and proclamation to our USHA President, LeaAnn Martin. The men’s division expects to be among the largest fields in years, drawn by the big prize money purse. And, are there any challengers to unseat the five-time Masters Doubles champs of Figueroa and Roberts? Finally, the USHA partners again later in the month of August with the ICHA to offer the Junior Wallball Nationals. Wallball continues to grow as the most popular one-wall game in New York and the competition should prove exciting. Additionally, we have Flushing Bank, an important local Community Bank, as our sponsor to help fund the cost of the event. So, make plans to see all of our one-wall action! Only a few steps away from the iconic Coney Island Boardwalk, there are plenty of attractions to enjoy while not on the courts! View draws and start times of the 57th USHA National One-Wall Championships HERE. Who are the defending champs? See the 2016 USHA National One-Wall Championships RESULTS HERE. MAUMEE, Ohio -- There's a new rivalry brewing in Women's Three-Wall! Defending champ Hilary Rushe and challenger Ashley Moler thrilled the Labor Day crowd on hand as well as the throng of online viewers to one of the most exciting Women's Open finals in recent years. While Rushe successfully defended her crown by edging Moler 16-21, 21-1, 11-10. You can still watch this and other matches from Toledo on the U.S. Handball YouTube Channel HERE. Hoping to unseat the defending champ, Moler forced the action in game one, delivering punishing power shots and pushing serves "out-the-door" for aces to reach a 20-12 lead. With confidence running high, Moler appeared to have the first game in hand, but Rushe battled back with a four-point run before missing a near-kill only inches from the crack. That late run set the tone for the second game, and Rushe answered Moler's challenge with purpose and force behind her shots. Moler took note, "[Rushe] definitely started hitting the ball harder and playing more aggressively in that second game." While Moler didn't let up, Rushe made sure the match would go to a third set. In the tiebreaker, the two played to a stalemate as each had an opportunity for match point at 10-10. Moler dove at a potential championship point, just missing a rekill. With both players playing to their limit and with bloodied knees, Moler couldn't return Rushe's deep serve to the left and conceded match point. As the two players completed a post-match hug and congratulations, it was obvious the crowd appreciated the effort and wanted more. This possible "rivalry" stays between the court lines, as the two opponents paired to win the Women's Doubles to complete Rushe's Three-Wall Nationals slam. Men's Open Three-Wall Big Ball Doubles. Labor Day ushered the conclusion of the Three-Wall Nationals with a number of doubles finals. In Men's Open Three-Wall Big Ball Doubles, Braulio Ruiz and Carlos Lemus struggled early to keep pace with New York's Chris Miranda and Allan Sanchez but ultimately won the title, 14-21, 21-2, 11-6. Sanchez and Miranda both dominated front court play, building an early lead and capitalizing on their opponent's mistakes. While Ruiz and Lemus were frustrated early-on, they settled in nicely to start the second game building a big 16-1 lead as Ruiz caught fire-ending rallies with kills. Forcing most of their serves deep and off the walls, Ruiz and Lemus continued to keep their opponents deep and from making plays in the front court. The second game success carried over into the tiebreaker, although Sanchez and Miranda made adjustments in the tiebreaker, they only managed six points after falling behind early. In Men's Open Three-Wall Small Ball Doubles, Marcos Chavez and Sean Lenning earned another title by holding off a second-game surge from Tyree and Jurell Bastidas to win 21-9, 21-19. The pair showed why they're the best doubles team in three-wall, as Chavez jumped all over their opponent's shots with rekills while Lenning unleashed his lethal service game. The Bastidas brothers pressed hard in the second to force a tiebreaker as they maintained a lead at 19-17 before running into a spot of bad luck. Tyree's first serve went into the floor followed by a Chavez shot that went just beyond Jurell's reach. A Chavez kill would tie the score at 19 before the champions would win match point, drawing a celebratory shout and a ball-toss by Chavez. The win sealed a slam for both: Lenning in the Men's Open, Chavez in the Masters and Open Doubles. Chris Miranda steps into a shot in the Men's Wallball Doubles final. In Men's Open Wallball Doubles, Chris Miranda and Allan Sanchez played mistake-free handball, showing the three-wall crowd the fast-paced close action of Wallball doubles. Playing against the Bastidas brothers, who had just finished the Three-Wall final moments before, Miranda and Sanchez didn't show any mercy en route to a two-game 21-6, 21-6 win. Watch the streaming video of the matches on the United States Handball Association's Facebook Page HERE. See results and draws HERE. Sean Lenning chases down a deep return in the Men's Open Singles Final. MAUMEE, Ohio -- Championship Sunday brought warm temps and clear skies, making the ideal conditions for all players competing on the courts at the Lucas County Rec Center. Three-Wall Great Vic Herskowitz now has company on the all-time list as Sean Lenning won his 9th Three-Wall Singles crown defeating Tyree Bastidas, 21-4, 21-6. While Bastidas showed tremendous athleticism that entertained crowds all week, he didn't have an answer to his opponent's devastating service game. Lenning continuously uncorked a lethal low driving serve to the right that seemed almost nonreturnable. The strong serve and uncanny court sense allowed Lenning to run away with big leads in each game, and a right-handed kill in the right corner sealed his ninth title. Watch the complete match on the United States Handball Association's Facebook Page HERE. In Women's Open singles action, Hillary Rushe punched her ticket to the final and a chance to defend her title with a two-game win over Kristen Hughes of Texas, 21-5, 21-7. A confident Ashley Moler delivered timely serves and passes in stopping nine-time champion Megan Dorneker in the semifinals. Using the simple formula of driving her opponent deep and fly-killing returns, Moler stayed in control, winning 21-11, 21-8 to earn a rematch against Rushe. "I've been playing a lot in Tucson, and it's definitely helped my game." Moler said post-match. Watch the Facebook Live stream of the Women's Open Singles final and more tomorrow (Monday) at 9 a.m. (Eastern). See today's results, tomorrow's match-ups and draws HERE. Jurell Bastidas punches a ball to the ceiling against Sean Lenning in the semifinals. MAUMEE, Ohio -- For the fourth consecutive year, Sean Lenning and Tyree Bastidas will face each other in the Men's Open Singles final. Both players appeared to be pacing themselves in the matches leading up to their annual showdown, but in the semifinals, each player turned up the intensity. The day's first semifinal, Lenning put together an amazing "serve-and-shoot" clinic stopping Jurell Bastidas in two games, 21-5, 21-2. In the second semifinal, Tyree Bastidas held Dane Szatskowski at bay by turning in two impressive 21-14, 21-15 games. "He played great, plus he just so fast." said Szatkowski post-match. Tomorrow's final match will be filmed by Buckeye Cable Sports Network. Also watch for live stream option on Facebook at Noon (Eastern). In Women's Open Singles semifinals action, defending champion Hillary Rushe will face off against Kristen Hughes and Megan Dorneker will match-up against Ashley Moler. Dane Szatkowski shoots against Braulio Ruiz in the Men's Open Quarterfinals. MAUMEE, Ohio -- Tiebreakers ruled the outcome of many matches on the second day of play at the 67th USHA National Three-Wall Championships. In Men's Open singles, many fans cleared the stands thinking Dane Szatkowski's run would end in the quarterfinals to Braulio Ruiz. Losing 11-21 and down 17-13 in the second, the match appeared to be wrapping, but impossible situations are exactly where Szatkowski thrives. Fighting off match point, Szatkowski took the second game, 21-20. In the tiebreaker, Szatkowski's serve started heating up, but Ruiz delivered a flat rollout to even the score at 5-5 to force a Szatkowski time out. When play resumed, Szatkowski completed a 6-2 run, only yielding a side out and two points before acing match point. Szatkowski will meet Tyree Bastidas in Saturday's semifinal. In the other half of the draw, Marco Lemus and Jurell Bastidas delivered the next thriller. After a big 21-6 game one victory, it seemed Bastidas would walk into the semis. But Lemus battled back in the second, holding off match point and finishing a 21-20 win to earn a third game. The tiebreaker was the same tense affair, with both players trading rallies and each having the chance to move onto the semifinals. Bastidas' experience proved to be the deciding factor as he scored the final point. Bastidas will face Sean Lenning in the other semifinal. Ricardo Palma shoots against Dan Valera in the Men's A Singles. MAUMEE, Ohio -- The 67th USHA National Three-Wall Championships kicked off under some cloud cover on a cool Thursday at the Lucas County Rec Center. While most first-day first round contests can be mismatches,there were a few exciting 11-10 tiebreaker finishes. In Men's Open Singles action, Oregon's Cody Townsend, making his first Three-Wall Nationals appearance, held off match point from Toledo's Tyler Stevens to regain the serve and score the decisive point to earn the victory. In other first round action, Braulio Ruiz bounced Anthony Collado in two games, 21-10, 21-3. Dane Szatkowski's experience was on display against Canadian junior phenom Ivan Burgos as the Chicago native ran away with a 21-1, 21-11 victory. Marco Lemus stopped Matthew Chu, 21-14, 21-6 , while Jurell Bastidas moved past Ryan Bowler, 21-9, 21-9. Finally Oregon's Dalton Beall battled with Juan Canales of El Paso in a close first game before winning 21-18. Beall settled in during the second game and closed out the match with a convincing 21-9 win. Beall will face defending champion Sean Lenning in tomorrow's quarterfinal at Noon on Friday. See tomorrow's match-ups, results and draw HERE. 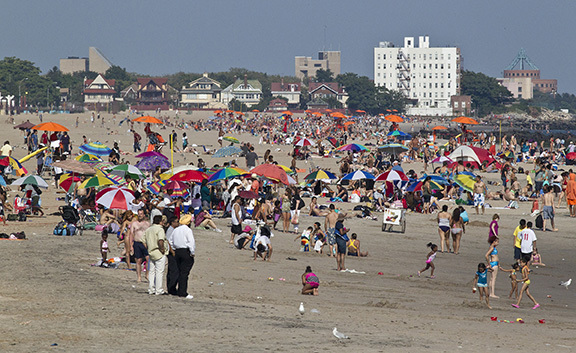 The Labor Day Holiday Weekend marks the end of summer as days become shorter (and cooler) in the coming months. We love to celebrate this weekend with Toledo Handball crew and over 200 players signed up to battle on the courts for five days. Don't forget to check out the "Things-to-do in Toledo" HERE. VENICE BEACH, Calif. -- In a classic NorCal vs. SoCal clash, the battle for Boy's 19-Under supremacy reached a boiling point on Sunday after simmering for two days at the 2017 USHA National Junior 3-Wall Championships. The Boy's 19-Under Small Ball singles final would be the rubber match between Anthony Sullivan (San Jose) and Andrew Garcia (Los Angeles). Garcia stunned Sullivan on Friday, winning the Big Ball singles in a tiebreaker. The next day, with the help of doubles partner Jon Gutierrez, Sullivan exacted some revenge by defeating defending champions Garcia and Brandon Ramirez for the Small Ball Doubles title. On Sunday, Sullivan and Garcia slugged it out for three games, battling fatigue and each other's desire to win before Sullivan prevailed, 21-1, 13-21 and 11-6. As soon as the match started, it appeared Sullivan would win in a walkover, hopping and hooking serves for which Garcia had no answer. Needing what seemed the entire first game to adjust, Garcia battled back in the second game, building a nice lead and holding it to force the deciding tiebreaker. Sullivan owned the serve to start, and shot out to a commanding 7-0 lead, but this time Garcia ferociously answered. The two exchanged a number of lengthy rallies that pleased the Venice Beach crowds that started to gather. After burning their timeouts, the exhausted finalists each welcomed a required glove change timeout to catch their breath. Once the action resumed, Sullivan pressed harder to pick up the remaining points to clinch his title. Down to match point, Garcia dug out a side out to delay any celebration for Sullivan, but the NorCal phenom regained the serve and scored the last needed point for the title. In other action, Luis Mendez (Santa Barbara) won the Boy's 17-Under Small Ball crown, defeating Jorge Pimentel (Tucson) in two games. The win gave Mendez his second National Juniors title after winning a Four-Wall championships earlier this summer at Los Caballeros. There was nobody better in the Boy's 15-Under division (small ball or big ball!) than Jesus "El Diamante" Mendez. The SoCal product from Los Angeles controlled both finals in two games, winning the Big Ball title over Fernando Espindola (Orange, CA) and the Small Ball championship over Joahan Campos (Kansas City). After suffering disappointment in the Boy's 13-Under Big Ball final, Anthony Sanchez (Los Angeles) edged Luis Fernandez (Santa Barbara) in an exciting 13-Under Small Ball final, 18-21, 21-13 and 11-3. Finally, Kena Byrd-Jackson and Marisol Maldonado defeated Belisa Camacho and Sophie Della Croce in an All-Tucson Girls 17-Under Doubles final, winning 21-10 and 21-12. Thank you to all the tournament volunteers, organizers and contributors who made the 2017 USHA National Junior 3-Wall Championships a success! Sunday was the birthday of LAFD Handball's Roy Harvey, who will also be inducted into the Southern California Handball Hall of Fame next month. To show their appreciation, players, coaches and families gathered and sang Happy Birthday to Harvey on court one (below). See the 2017 USHA National Junior Three-Wall Championships final results HERE. VENICE BEACH, Calif. -- The summer crowds mixed with SoCal natives and tourists from all over the world filled up the boardwalk to take in another beautiful day at the beach. Many who passed by the handball courts nestled between Muscle Beach and the Pacific Ocean stopped to watch high-level action as many finals played out on Saturday at the 2017 USHA National Junior 3-Wall Championships. In the Girl's Singles final, Kena Byrd-Jackcson defeated Team 520 teammate Belisa Camacho in two games, 21-6, 21-4. Next, Tucson's Ayden Brule swept the 11-under Small Ball and Big Ball divisions, defeated Xavier Flores of Los Angeles in each final. In Boys Big Ball action, Ricardo Renteria of Los Angeles drubbed Ricky Serrano in the Boy's 17-Under final, 21-3, 21-0. Serrano put together some great rallies throughout the match, but the Bellflower High product controlled the court, sending the ball deep along both walls. Eddie "Torito" Rocha from Lake Elsinore, CA also dominated his championship final, defeating LA's Anthony Sanchez 21-2, 21-0 for the Boys 13-Under Big Ball title. Both 19-Under Boys doubles finals were play at the day's end, showing off the best doubles competition as the sun lowered on the Pacific. Jacob Hernandez and Fernando Balladares battled Jose Hernandez and Eduardo Garcia for two tough games, prevailing 21-17 and 21-19 for the Big Ball crown. In small ball play, Anthony Sullivan and Jonathan Gutierrez clicked at the right time as they upended defending champions Brandon Ramirez and Andrew Garcia, 21-15, 21-9. Sullivan and Garcia will see each other again in Sunday's Boy's 19-Under Small Ball final. VENICE BEACH, Calif. -- The second day of the 2017 USHA National Junior 3-Wall Championships at the Venice Beach Rec Center gave fans and players even more competitive matches and ended with a few championships decided. The first major title was the Boys 15-Under Small Ball Doubles which was decided by four Santa Barbara TGOP products: Bryan Trejo and Daniel Mora vs. Luis Fernandez and Oswaldo Perez. Fernandez and Perez struck first with a surprising game one victory, but Trejo and Mora battled back to force the tiebreaker where they edged their teammates, 11-6 for the title. To wrap the day's action up, Andrew Garcia (right) and Anthony Sullivan played for the Boys 19-Under Big Ball singles crown and provided a glimpse of what to expect for a Boys 19-Under Small Ball final. Sullivan looked strong early, ringing up a seven-point lead en route to a 21-19 game one win. But in the second, Garcia showed off his Big Ball prowess, mixing up speed and power to force a deciding third set. In the tiebreaker, Garcia rolled, jumping to a 7-0 lead to route Sullivan 11-1 for the crown. "I ran out of gas in the second," Sullivan said. "I used up everything in the first and couldn't adjust after." Garcia credited his win to settling down and letting his game come to him in the second and third sets. "I was rushing things, and my shots were off in the first game." Friday's outcome produced more drama to a possible Sunday rematch in Small Ball. SCHA continued to roll out the red carpet for junior players and families on Friday. Mark Zamora, aka "Rapper" manned the grill which provided delicious tacos for all participants and families. (If you really want to get your mouth watering, check out the United States Handball Association's Facebook video of what was served!). During a small break in the action, former junior champion and R48Pro Mando Ortiz with Tucson's pro qualifier Abe Montijo gave the kids a thrill with a player clinic on the main court. Kids worked on their serve and were shown how to cut the ball off on the three-wall court. Special thanks to both players for sharing their time teaching the next generation better skills! VENICE BEACH, Calif. -- Sunshine, sand and waves greeted junior handball players on Thursday morning for the 2017 USHA National Junior 3-Wall Championships at the Venice Beach Rec Center. The players were also treated to a generous "swag bag" which included three shirts, wristbands, a hat and more. The Southern California Handball Association, LAFD Handball, and a host of supporters made sure the kids were rewarded for making the commitment to play in this year's tournament. With 79 entrants, the Venice Beach Rec Center's four courts were in use the entire day with small ball and big ball matches! Gary Cruz, Marcus Hough, Roy Harvey, Jim Vandenbos, Andy Gutierrez, Rick Wheelock and a number of other local volunteers made sure all the junior players were well-fed and had good officials refereeing matches from start-to-finish. One of the day's final matches took place between Santa Barbara teammates Grace Ramos and Mileyni Sanchez. Ramos advanced, but Sanchez put up a tremendous fight in the second game, nearly forcing a tiebreaker only to fall short 14-15. The two new players from the Santa Barbara TGOP program shared a handshake, hug and walked off the court together smiling ear-to-ear. It was a tremendous show of sportsmanship and the Spirit of Handball.